The five baby owls that hatched this year have all fledged and are roosting in our palms trees. The first three started early, and the youngest two struggled to keep up. Our front yard is still ‘home base’ for the young owls as they continue to improve their flying techniques. It’s obvious they love each other as they twitter and snuggle… encouraging one another to try new things. The parents aren’t far away and one occasionally stops by the nest box with a dead rodent and the babies let out a screech and fly there to get it. Whoever grabs it first, hops from branch to branch, trying to keep it away from its siblings, until it can swallow it. This brood of owlets have been pretty quiet so far, which indicates they have been well fed. That should change soon, as the parents withhold food as incentive to teach their babies to hunt their own prey. This entry was posted in Birds, Fauna, Owls on May 30, 2016 by Shelly. This entry was posted in Fauna, Owls on April 17, 2016 by Shelly. Baby owls – it’s official! There are a total of three baby owls this season, and all are flying very well. There weren’t any crash landings or other mishaps as far as we know. Each one can fly back and forth to the pine tree branches with ease. Then they take test flights around the neighborhood, practicing their take offs and landings. 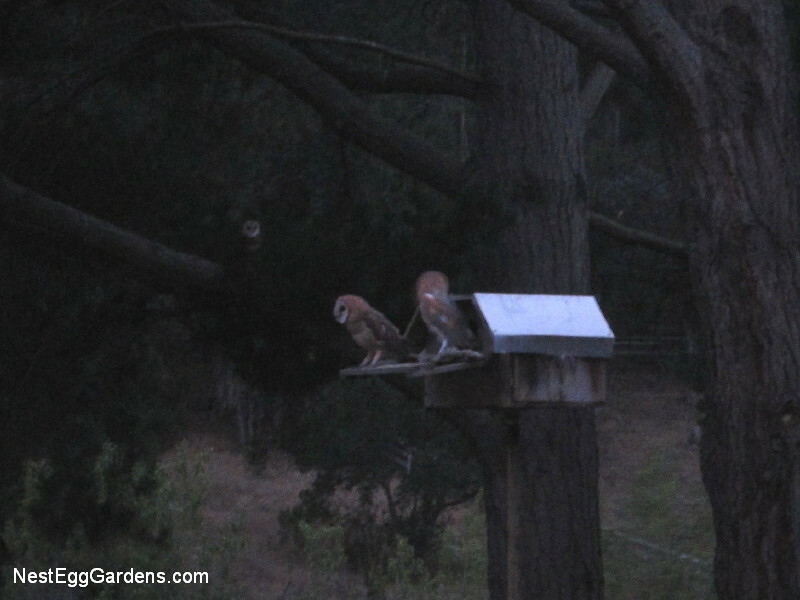 Last night only one came out of the nest box… the other two were roosting in the trees. This batch of owlets are still more quiet than normal, which is a good thing. This entry was posted in Fauna, Owls on May 28, 2015 by Shelly. This young owl was stretching and admiring his wing, when he almost fell off the perch (see video). This entry was posted in Fauna, Owls on May 24, 2015 by Shelly. 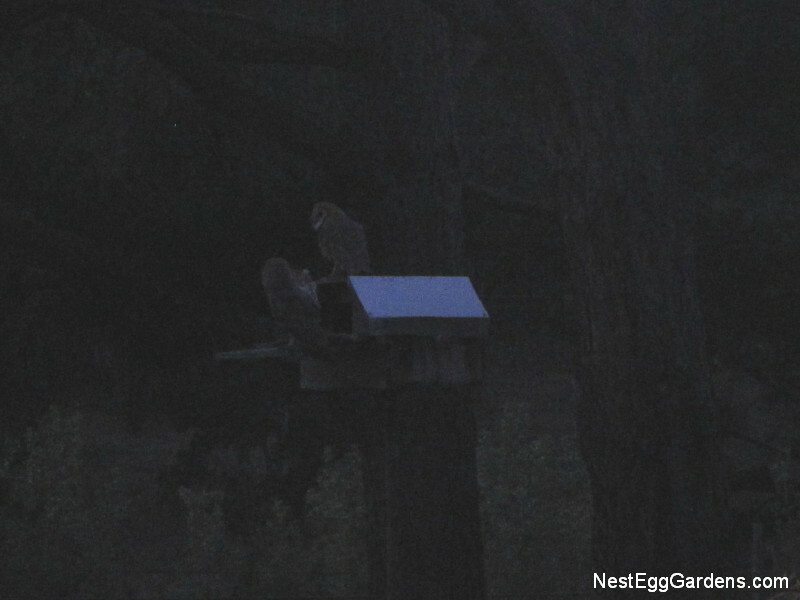 Almost too dark to see, three owlets are outside of the nest box. We haven’t seen them try to fly, but they were flapping their wings like crazy… and it sounded like there were 2 more inside.Â Could there be 5 babies? This entry was posted in Fauna, Owls on May 23, 2015 by Shelly. 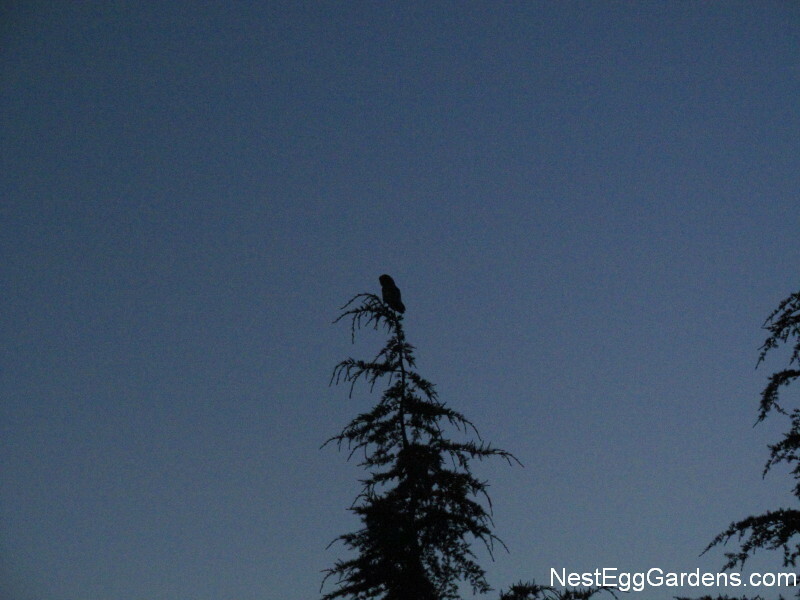 After sunset last night, the first baby owl came out to practice flapping its wings (they look so big already!). Two more babies tried to get out there… they were all trying to stay close to the door and flap at the same time, and they got all tangled up in each other. The next morning these two were still out at 6am… too excited to go to bed (see video). These siblings speak to each other in strange soft high pitched lyrical sounds. That’s different than prior years owlets, who preferred screeching loudly. This entry was posted in Fauna, Owls on May 22, 2015 by Shelly. The largest baby owl watches me walk around the yard in the mornings. When I talk to it, it bobs its head sideways… so cute! (see Facebook feed for video).Â They have been a pretty quiet batch this year, which means they have been well fed. 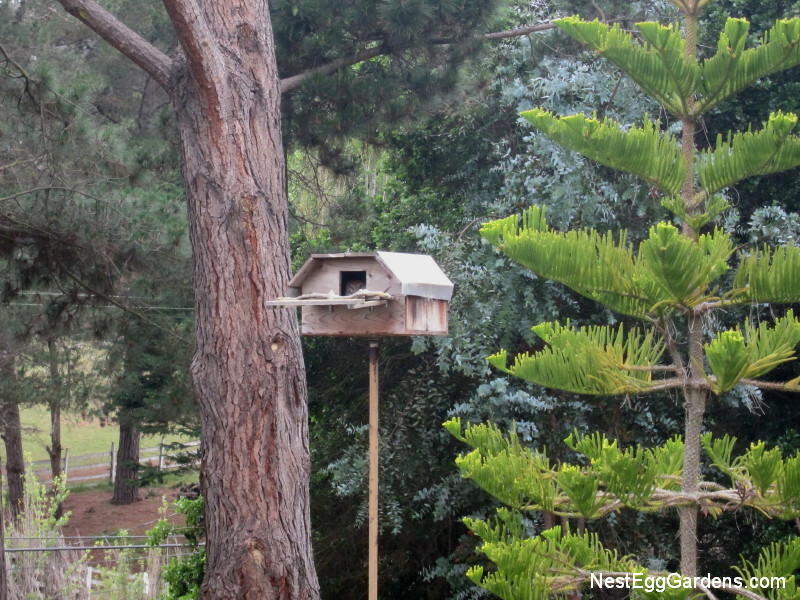 Yesterday a huge vulture was perched on top of the nest box. It scared the baby owls and we shooed it away. Being scavengers, it was unlikely it would attack, but you never know. Could it have been attracted by some uneaten rotting vermin in there? This entry was posted in Fauna, Owls on May 18, 2015 by Shelly. The baby owls are getting big. We’re still not sure how many there are… it sounds like 3 or more. They are flapping their wings and running around in there (see video on Facebook Feed). After dark they have been seen tentatively stepping out onto the porch. It won’t be long until they start learning how to fly! This entry was posted in Fauna, Owls on May 13, 2015 by Shelly. 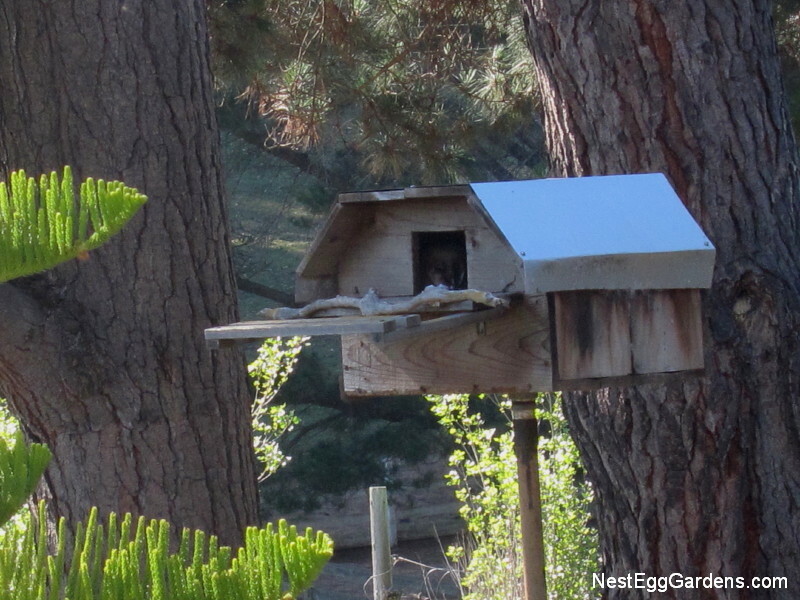 We can see the baby owls peeking out of the nest box now. They are fuzzy looking with darker faces, and are getting so tall! Mama owl stays close by while her mate hunts for dinner. He could be seen delivering a big rat a short time later. He just threw it in there and the owlets tore it apart. This entry was posted in Fauna, Owls on May 5, 2015 by Shelly. Mama owl roosted in the palm tree for the first time in a long time. 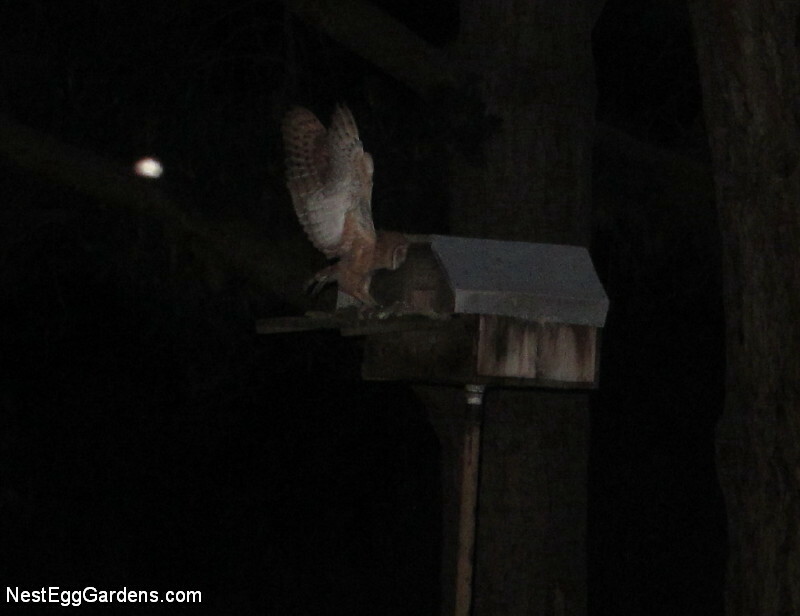 She has been in with the baby owls for weeks, and comes out every night about 8pm to stretch her wings, before flying out to hunt. But tonight, she was heard screeching at our cat, Buddy about 7pm. 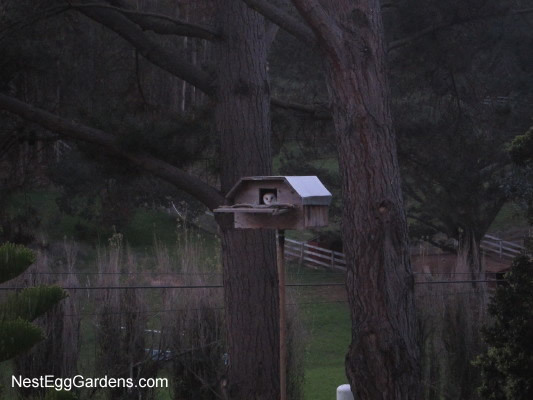 It was too early for her to be out… plenty of daylight left, but she was nervous about him walking around under the nest box, and had flown down to tell him all about it. I thought she may be over-reacting, but reconsidered when she dive-bombed him, and he jumped up about 3 feet off the ground to take a swipe at her! 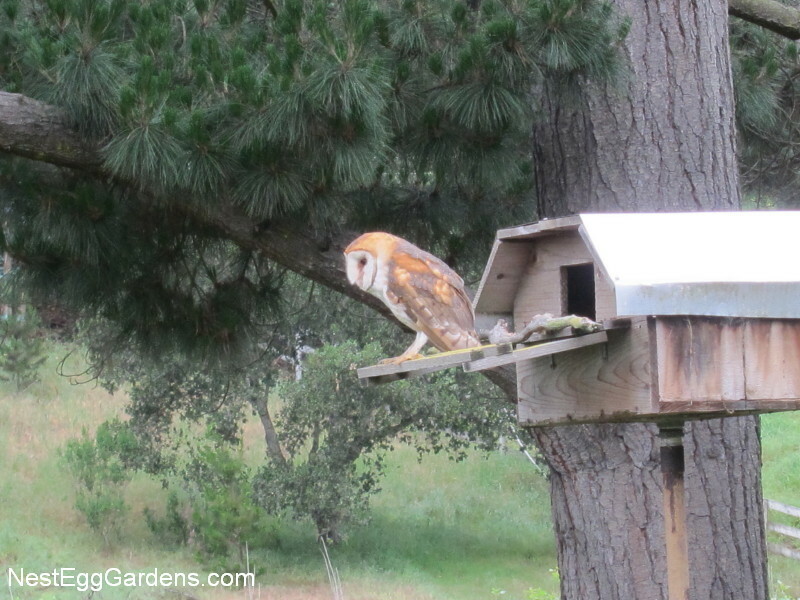 Buddy has kept the squirrels out of our apple trees, and is a good mouser… but our barn owls are off limits! We are planning to lock him up at night when the babies first start to fly… just in case. After we brought the cat in, Mama owl calmed down and flew back up into the palm tree. Later she flew back down to the pine tree and was followed by her mate a short time later. This entry was posted in Fauna, Owls on April 24, 2015 by Shelly. Baby owls hatched – dad missing? 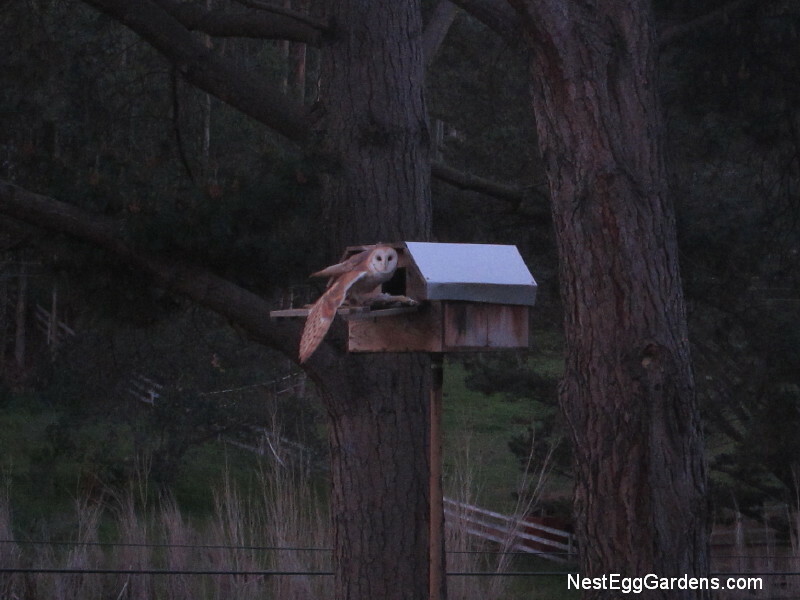 04/20/15: We can hear little owl voices in the nest box in the evenings and the mother owl can be seen sleeping in there with them today. 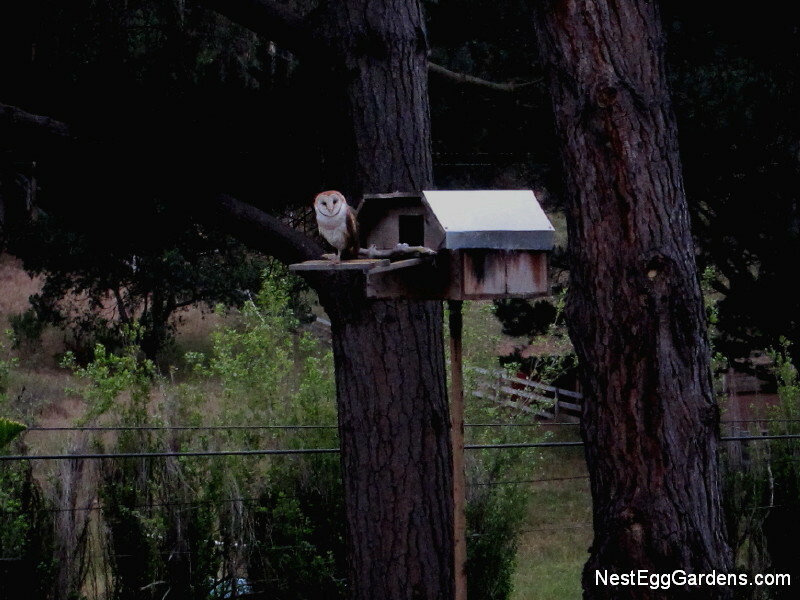 She has been the only owl flying in the front yard lately as we haven’t seen her mate in over a week. Because barn owls mate for life, it’s very unusual that he is not roosting in our palm trees… and we fear that something has happened to him. There are Great Horned owls in the area and they are barn owl predators. Hopefully the young owls are old enough to be uncovered for lengths of time while she struggles to provide enough food as a single parent. Update 04/23/15: The last couple of nights, we’ve noticed another owl sneaking out the back side of the palm tree, heading in the opposite direction. So, the male owl is around after all! 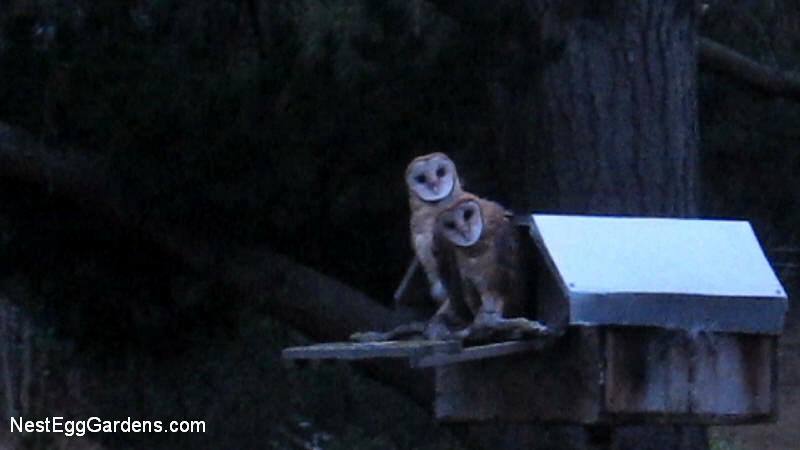 This behavior is different from past owl couples… where the male owl checked in with the female before going out to hunt and communicated more in general. She seems nervous and over protective, and he is fairly aloof. But the babies sound louder… indicating they are growing, so we think all is well. This entry was posted in Fauna, Owls on April 20, 2015 by Shelly. 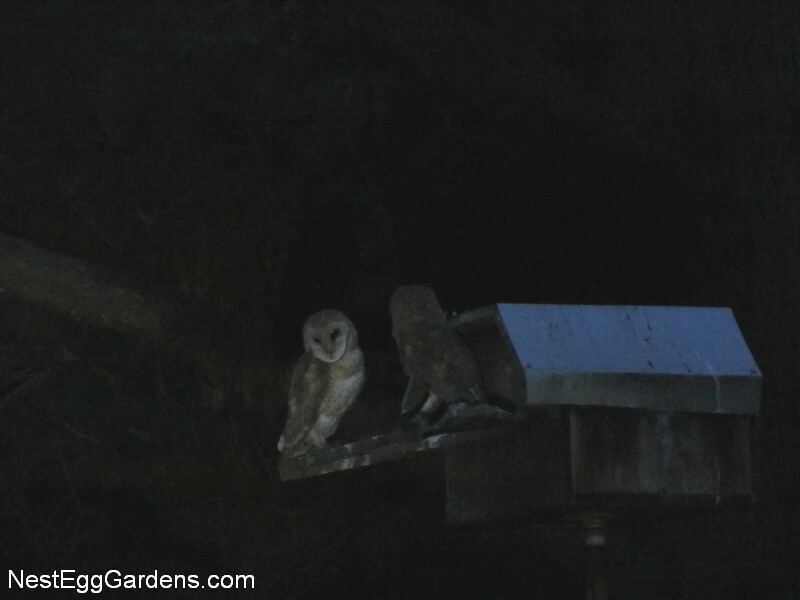 Last year was the first time in 6 years that barn owls did not raise babies in our nest box. We’re not sure why they didn’t lay eggs last summer. Maybe the drought affected them? Or it was nature’s way of controlling the population? We’ve watched them raise 21 baby owls in 5 years in our box, plus there was another pair that laid eggs in a tree around the corner in 2013. 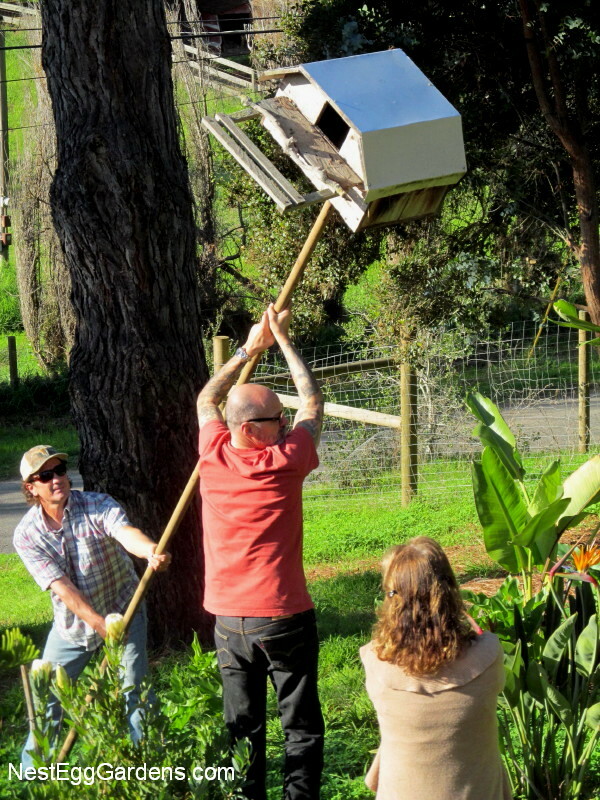 That prompted a neighbor in that area to put up an owl box. 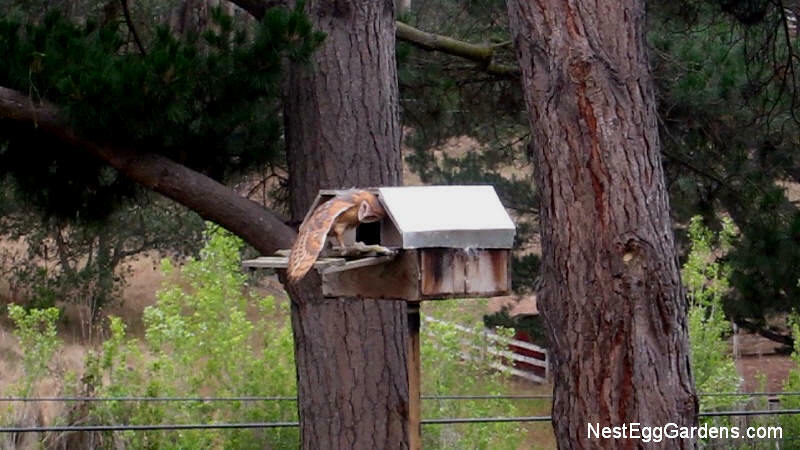 There was a lot of owl activity in both of our boxes last year… but no baby owls. This year looks promising. 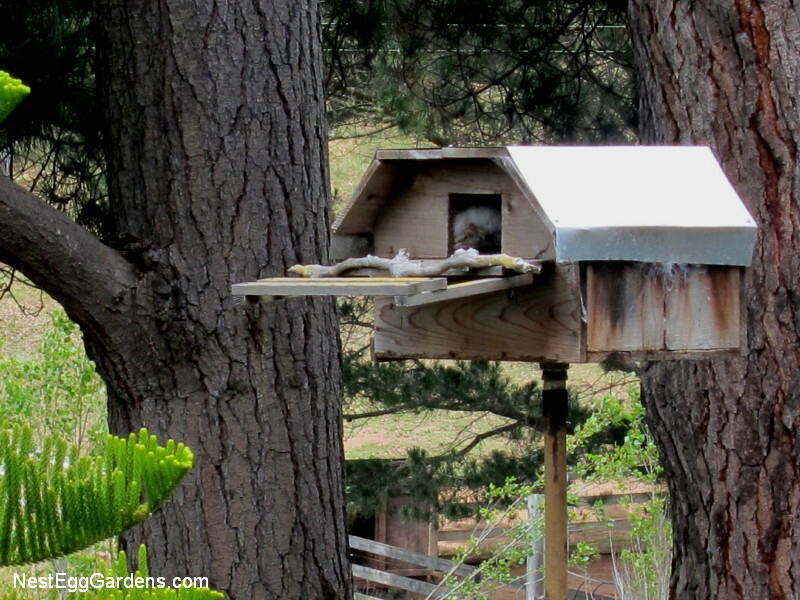 The female has been roosting in the box since February 11th. The male has been feeding her in there, so we think she’s laying eggs. He swoops down from the palm tree every night at sunset… goes inside and they make noises and move around for a minute before he takes off down the canyon to hunt. 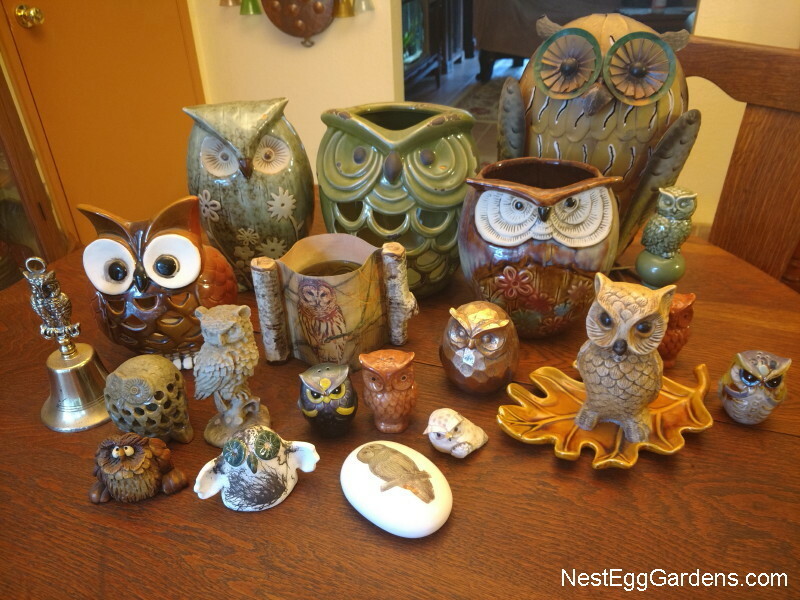 This entry was posted in Fauna, Grounds, Owls on March 5, 2015 by Shelly. At the extreme North/East corner of the grounds of Nest Egg Gardens, resides a old dilapidated picnic bench, weathered and peeling. Not as popular as it used to be… this high spot, above the chicken shed has a nice sunset view, up over the roof of the homestead. The palm trees provide roosting space for a pair of barn owls, who fly out at dusk and soar up and down the canyon every night. 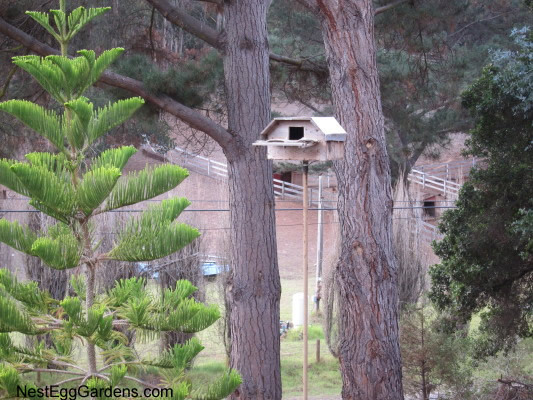 This entry was posted in Chicken Shed, Fauna, Grounds, Owls on February 4, 2015 by Shelly. This entry was posted in Fauna, Owls on March 25, 2014 by Shelly. November: time to clean out our barn owl nest box. It was full of torn up owl pellets… lots of hair and rodent bones. The box faces more south this year, providing a better view from window. 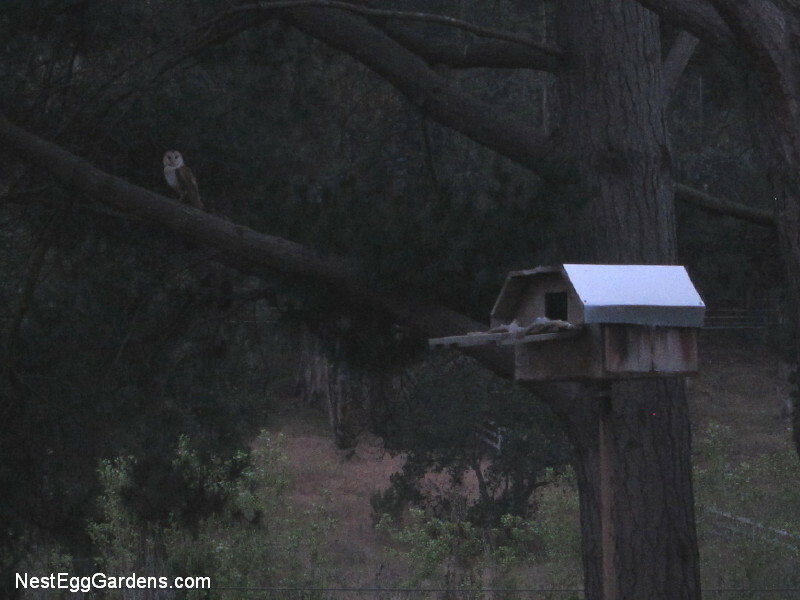 This entry was posted in Fauna, Grounds, Owls on November 17, 2013 by Shelly. I swear his tail gets fatter every day. It’s been 1 month since this kitten showed up on our doorstep, and we’re crazy about him. He’s been busy hunting (lizards – his current specialty). 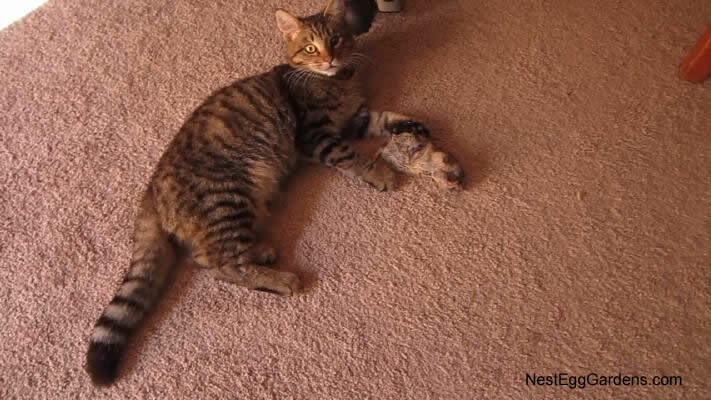 Bought him some fake mice, but they keep ending up on Reo‘s bed…covered with slobber.Â Found him in the garage today having his way with a recently trapped gopher that I had ‘disposed of’. He’s shaping up to be a better hunter than our current cat Rose, and just might earn his keep around here patrolling rodents. His injured eye gets lazy when he’s relaxed. 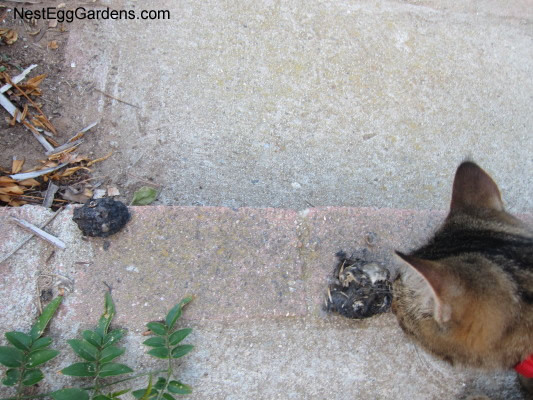 Inspecting the fresh owl pellets – looks like a gopher skull in there. 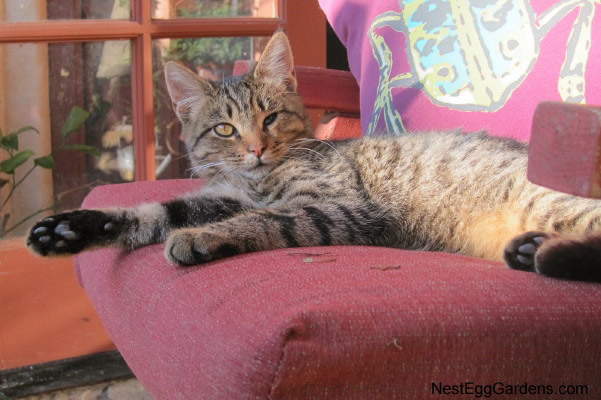 This entry was posted in Fauna, Feline, Owls and tagged Buddy on October 10, 2013 by Shelly. 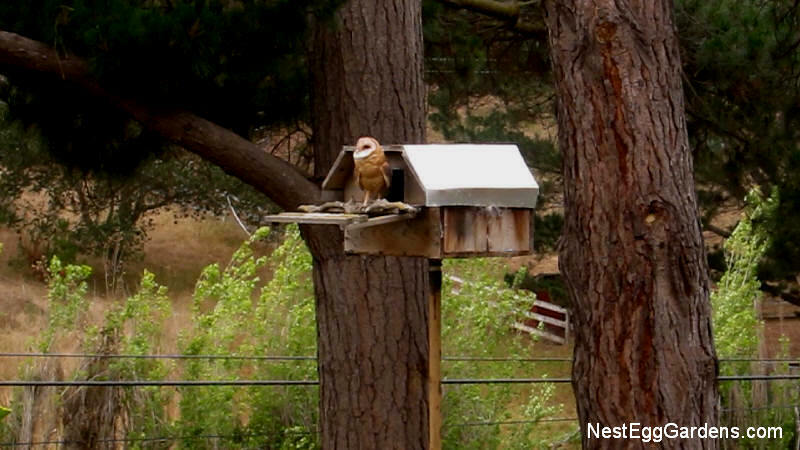 The three baby barn owls that hatched in this nest box are growing up fast, and are now learning how to hunt. They usually stay in the area until late in the year, when we assume they venture off to find their own territories. This entry was posted in Fauna, Owls on July 22, 2013 by Shelly. 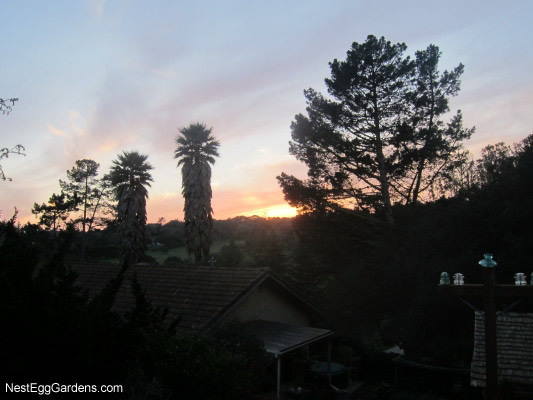 Barn owls have been roosting in our two Mexican palm trees for years. The dead palm fronds (aka petticoat) provide a perfect sheltered spot out of the sun and wind, but with plenty of perches and room to move around. Recently, we saw newly planted grape vineyards with palm trees along the perimeter, and wondered if it was to attract these amazing nocturnal predators. 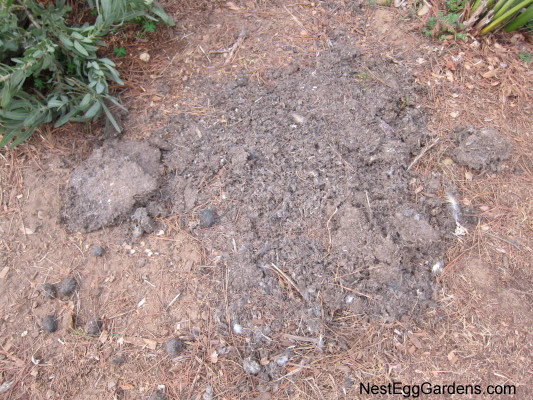 Look under palm trees with petticoats for owl pellets (balls of regurgitated rodent fur & bones) to see if owls roost there. 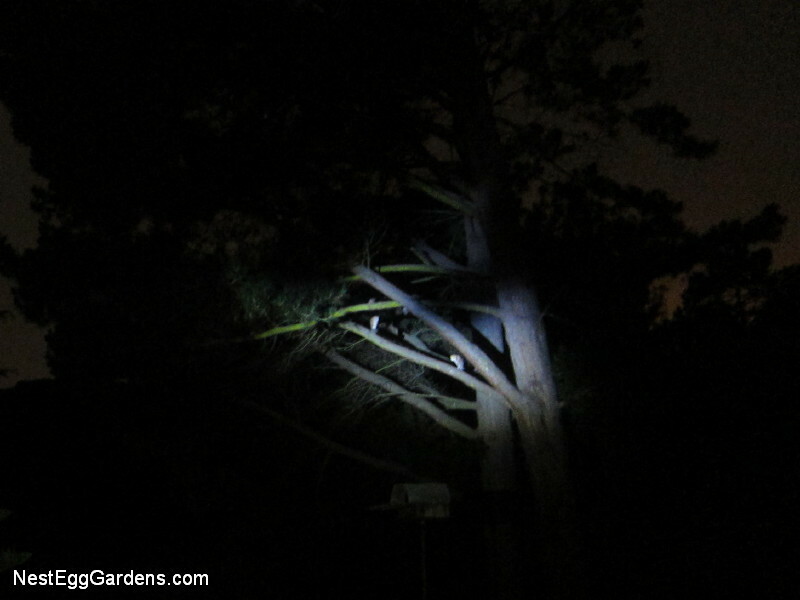 When we heard a couple of owls doing a lot of screeching and noticed shredded material dropping out of the trees back in 2008, we erected a nesting box on a 20 foot pole. 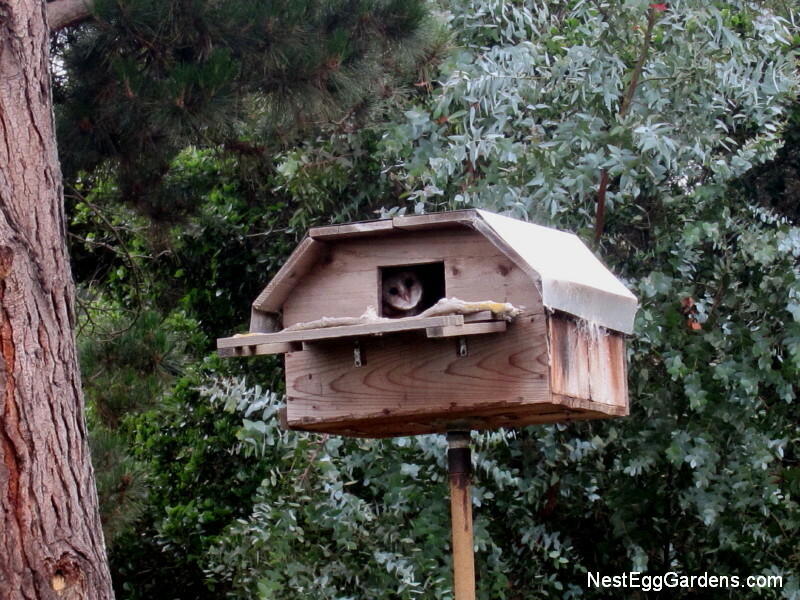 Since then, the owls have been laying eggs and raising their young in the nest box every summer. Pictures and stories were posted on our old website here.